Preheat oven to 400º F. Grease a large cookie sheet. Whisk together the dry ingredients. Rub in the butter. Add rind and stir until blended. Add milk gradually and stir until a soft dough forms. Knead 3 to 4 times on a floured surface. 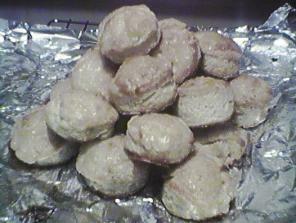 Roll to 1/2 inch thickness and cut out 1 1/2-inch biscuits. Arrange on a sheet. Dip the sugar cube halves into the juice. Put a half on each round. Bake in oven center until glazed, about 15 to 20 minutes.